One minute, the Portland Thorns fans were serenading Karina LeBlanc. Minutes later, they were back to normal, issuing their usual chants toward the opposition. The fans still hold the former Thorns goalkeeper in a special place in their hearts. LeBlanc and the fans exchanged goodbye waves after the Thorns’ 2-2 draw against Chicago on Friday afternoon at Providence Park. During the game, the fans reminded LeBlanc that she is no longer part of the Thorns. The sight of LeBlanc likely took the Thorns fans back to the 2013 season, when the Thorns won the inaugural NWSL championship with LeBlanc in goal. She finished the season first among goalkeepers with 11 wins, second in saves and fourth in goals-against average. Her performances were stellar, yet it was more than just helping the Thorns win the league championship that endeared LeBlanc to soccer fans. It’s LeBlanc’s energetic and bubbly personality. Her smile was a constant presence on the team. The Thorns traded LeBlanc to Chicago in exchange for a second-round pick in the 2015 NWSL College Draft in January. The move came after the Thorns announced they had acquired German goalkeeper Nadine Angerer, the winner of the 2013 Ballon d’Or, given to the best professional women’s professional soccer player in the world. Knowing she was going to play backup to Angerer, LeBlanc preferred to remain as a starter, and the Thorns moved her to Chicago. The Red Stars are currently 6-6-3 (21 points) after the draw at Portland. They will host the Thorns (6-6-3, 21 points) in the second game of the home-and-home series Wednesday night, a game with significant playoff implications. LeBlanc, 34, is fourth in the NWSL in wins with six, fourth in saves with 42 and third in shutouts with three during the 2014 season. 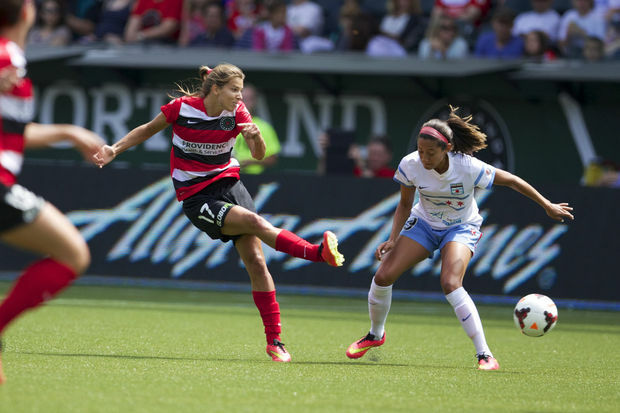 The draw against the Thorns, in which the Red Stars rallied from a two-goal deficit, stopped a five-game winless streak and kept the Red Stars firmly in the playoff race. LeBlanc and the Red Stars have nine games remaining in the regular season, including a third game against Portland at home (July 17). They are hoping to earn a playoff berth after finishing tied for fifth in 2013. Perhaps LeBlanc will make another visit to Portland during the 2014 season, which would be in the playoffs.